Recall that I used two 200 yard skeins of Crown Mountain Farms Sock Hop yarn (held double) to create a kerchief that ended up measuring 40″x 28″ x28″. My version includes “k2tog, YO” pairs on every 7th wrong side ridge row. By adding an additional yarn over to either side of the last 7 ridge rows, I was able to create elongated ends suitable for draping or tying. Blocking really opened up the yarn overs, both within the fabric and along the edges. 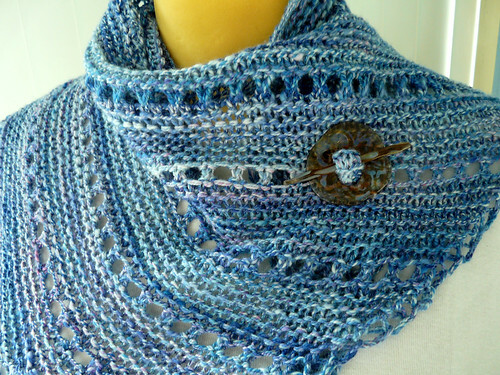 Add Laura’s Kerchief to your Ravelry queue. Just as the seasons are changing, what do I come out with finally? 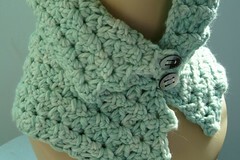 An actual pattern for the neckwarmer portion of the Easy Glamour duo that debuted in February ’08. 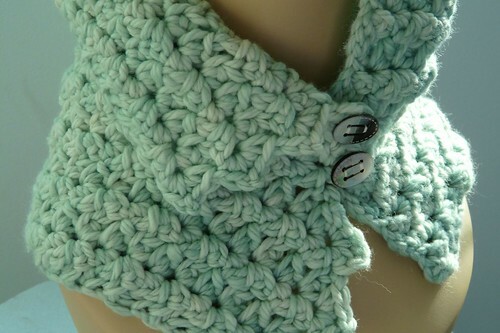 The Easy Glamour Crochet Neck Warmer (PDF) is crocheted lengthwise using a variant of a shell or fan stitch. While you’ll need a couple of buttons to fasten the neckwarmer, you do not need to make buttonholes, thanks to the open chain stitch. By the way, the pattern includes “how to” stitch information and a construction schematic to assist in finishing your creation. Once the piece is complete, you simply sew those buttons on the left side and there you have it: Easy Glamour in less than two days. Want to add Easy Glamour to your Ravelry queue? Clique ici. 14 comments to So, What’s New? Both FO’s are gorgeous! Your neckwarmer is tres chic!! The kerchief is so pretty! I love those blues, and the blocking and YOs really makes it look light. wow. that kerchief is drop. dead. gorgeous. you’ve got mad skills, woman! Love you mods to the kerchief. Beautiful. you are so kind to share your lovely pattern. now a real reason for me to learn to crochet! absolutely LOVELY, karen. and so is your kerchief. it lays PERFECTLY! How pretty! You’ve been busy! Oh, that kerchief is fabulous! If only I wielded a crochet hook as well as a knitting needle, I’d start an Easy Glamour right away! I like the blue kerchief. Very nice! Gorgeous, I will be casting on for at least 1 of these patterns TODAY! I love the kerchief (new English word for me 🙂 ). That broche really gives it a little extra. You make such beautiful things! Your version of the kerchief is just stunning! Very cute crochet neck warmer, too.